Rosemont College announces “Duffy’s Cut Revisited,” a talk featuring guest lecturer Dr. William E. Watson. The event will take place in the Rotwitt Theater at the McShain Performing Arts Center, on March 14, 2018, from 7 to 9 p.m., with a reception at 6:30 p.m. In 1832, a railroad contractor named Philip Duffy hired 57 Irish immigrant laborers to build Mile 59 of the Pennsylvania and Columbia railroad line — the area now known as Duffy’s Cut. Within six weeks, all 57 laborers were dead, and their bodies were buried anonymously in a mass grave. Dr. Watson and his brother, Rev. Dr. Frank Watson, founded the Duffy’s Cut Project in 2002. The project is an ongoing archival and archaeological investigation into the lives and mysterious deaths of the 57 Irish immigrant labors of Duffy’s Cut. While early reports had said the laborers died of cholera, archaeological evidence uncovered by the Duffy’s Cut Project in 2009 and thereafter demonstrated some died of blunt force trauma and bullet wounds. 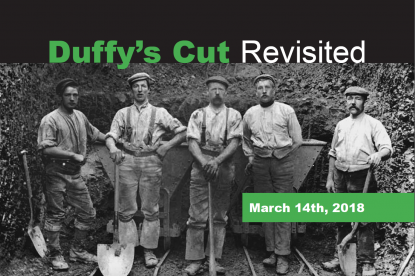 Duffy’s Cut has been the subject of books, several documentaries on Smithsonian Network and PBS, as well as radio and TV programs on NPR, RTE, BBC, CNN, the Travel Channel, CBS, ABC, and NBC. Hundreds of newspapers and magazines have covered the story, including the Wall Street Journal, The New York Times, Smithsonian Magazine, The Irish Times, AP, and Reuters wires. William E. Watson received his Ph.D. in history from the University of Pennsylvania and is a professor of history at Immaculata University.